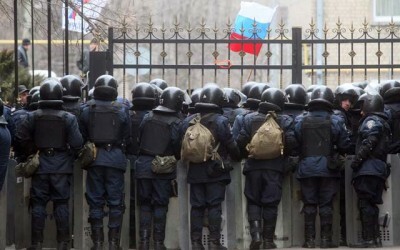 Photo: Riot police at pro-Russian protest in Donetsk. The Obama administration is utilising Moscow’s incorporation of Crimea into the Russian Federation to escalate its campaign of threats and sanctions. To this end, the United States is lining up its puppet regime in Ukraine and its regional allies to prepare a series of military provocations. Following a speech Tuesday to the Russian Federal Assembly, President Vladimir Putin signed a treaty annexing Crimea. US Vice-President Joseph Biden responded by accusing Russia of a “blatant violation of international law” and making a “brazen military incursion.” The US was considering deploying ground troops to the Baltic States on new military exercises, he threatened. Provocations to legitimise war need not take place only within Crimea. They could be staged throughout eastern Ukraine. Putin’s speech tempered an endorsement of Crimean annexation and denunciations of the US and its allies for creating the crisis in Ukraine with the offer of a compromise. The Maidan protests in Kiev, he said, were utilised by “nationalists, neo-Nazis, Russophobes and anti-Semites” who “executed this coup,” and who had “foreign sponsors.” He accused the West of using double standards because it intervened in Kosovo in 1999 and endorsed that province’s unilateral separation from Serbia. In Ukraine, he said, the West had behaved “irresponsibly,” pushing the protests that toppled President Yanukovych until Russia “could not step back any more.” He declared that “Russia has national interests that need to be respected.” It had faced the possibility of Sevastopol, where Russia’s Black Sea fleet is based, being used by NATO, which would have threatened southern Russia. He concluded, however, with a pledge not to “split Ukraine” or trample on Ukraine’s national feelings, implying that there would be no further Russian military interventions. He then signed a treaty accepting the “Republic of Crimea” and the city of Sevastopol as parts of the Russian Federation. A combined G-7 and European Union crisis meeting has been called for next week in The Hague, following a request by US President Barack Obama. The US, together with the European Union, is threatening an escalation of sanctions—so far limited to targeting political figures close to Putin—to cover businesses and trade. But yesterday, the US again focused its energies on building a regional military alliance against Russia. The US and the EU are providing all of the funding and equipment to Ukraine’s military, now reorganised around a newly-created 60,000-strong “National Guard” under the leadership of fascistic politicians Andriy Parubiy and Dmytro Yarosh and encompassing Right Sector and Svoboda militias. A key role in US military scheming is being assigned to Poland, with Biden holding talks in Warsaw with Prime Minister Donald Tusk and President Bronislaw Komorowski. The plan is to purchase the Medium Extended Air Defense System, or MEADS, from the US. Thompson noted that the Obama administration “late last week gave prime contractor Lockheed Martin permission to offer” MEADS to Warsaw. Poland has announced plans to form a multinational military brigade with the Caucasian states, Ukraine and Lithuania. The proposal was first made in 2009, but defence ministers will meet this week to form a brigade that theDaily Telegraph said “would straddle NATO’s eastern border and bring Ukraine’s armed forces closer to the Western fold.” Last week, Ukraine’s deputy defence minister visited NATO headquarters to discuss the move. Biden also met with Lithuanian President Dalia Grybauskaite, Latvian President Andris Berzins and Estonian President Toomas Hendrik Ilves. Latvia and Estonia share borders with Russia. All three have significant Russian populations. Russians in Latvia, making up a third of the population, are considered “non-citizens” and cannot vote. This week, 1,500 Latvians who fought for Nazi Germany’s Waffen SS held their annual parade through Riga. The Islamist Turkish government of Recep Tayyip Erdogan has made its most bellicose statements against Russia to date, warning that it will close the Bosphorus to Russian ships if there is any violence against Tatars in Crimea. Turkey will not recognize the referendum in Crimea, Erdogan said.